An Explanation by Conan Doyle is an article written by Arthur Conan Doyle published in The New-York Times on 24 april 1930. I have always found your paper to be fair in psychic matters. 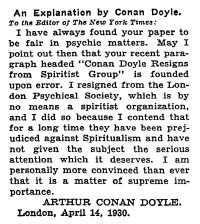 May I point out then that your recent paragraph headed "Conan Doyle Resigns from Spiritist Group" is founded upon error. I resigned from the London Psychical Society, which is by no means a spiritist organization, and I did so because I contend that for a long time they have been prejudiced against Spiritualism and have not given the subject the serious attention which it deserves. I am personally more convinced than ever that it is a matter of supreme importance. This page was last edited on 3 February 2019, at 00:02.